We at Remo, Inc. believe in the power of music to transform lives. We are fortunate to meet and train professionals from all walks of life to facilitate HealthRHYTHMS Group Empowerment Drumming all over the world. We have already trained over 4,000 people to facilitate HealthRHYTHMS in 26 countries. We believe in the honest intent of these individuals to offer programs based upon the HealthRHYTHMS protocol as a service to their communities. In this spirit we offer certain benefits to people who complete our training to become HealthRHYTHMS Trained Facilitators. 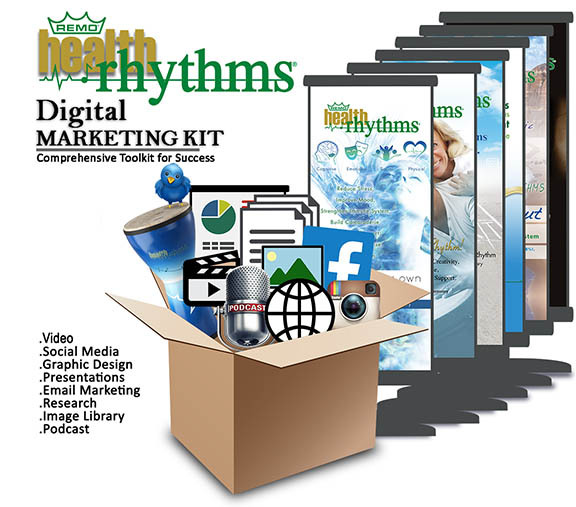 HealthRHYTHMS Digital Marketing Kit ($7,500 Value) – This comprehensive set of marketing tools & tutorials allows a HealthRHYTHMS trained facilitator to complete the training and immediately walk out of the training and have the tools to market like a professional. Global Facilitator & Event Finder – This tool allows people all over the world to locate a HealthRHYTHMS trained facilitator near them by simply typing in their postal code or country. 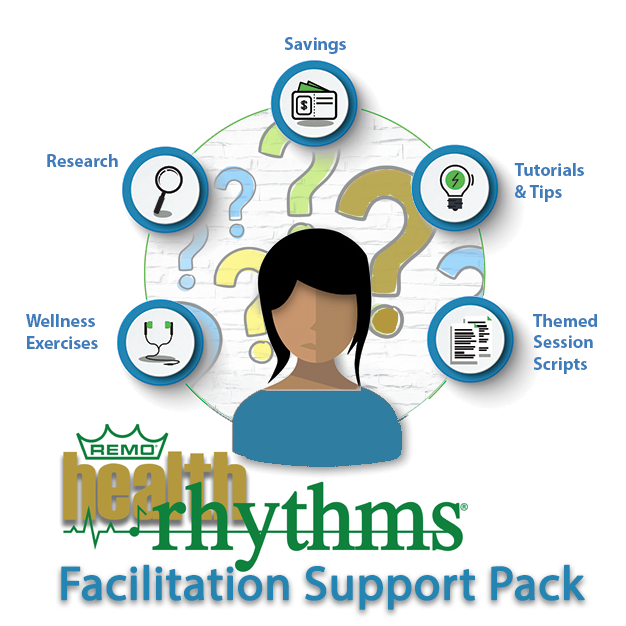 *HealthRHYTHMS Trained Facilitators are independent contractors and are not employees of Remo, Inc.
HealthRHYTHMS Mentoring Programs - Our training programs are robust and provide all the tools needed to learn and begin facilitating HealthRHTYHMS. We recognize that each facilitator has unique gifts and life circumstances and may on occasion desire support after the training, so we offer a suite of mentoring programs to provide customized support if/when needed. These are available exclusively to graduates of our training programs. Quick Start HealthRHYTHMS Mentoring - Our Quick Start Mentoring program will support you through the basic, primary and foundational steps needed to launch an effective HealthRHYTHMS program. Designed to save you time and put your mind at ease, Frank has more than 12 years experience facilitating HealthRHYTHMS programs. Unlocking the Power of the Protocol HealthRHYTHMS Mentoring - The HealthRHYTHMS protocol is a system. By appropriately applying your creativity and unique gifts, the protocol can become an even more powerful tool. This means you can tailor HealthRHYTHMS programs to meet the specific measurable goals of an organization. Unlocking the Power of the Protocol will give you the tools you need to create specific and measurable outcomes. HealthRHYTHMS Monthly Mentoring - With over 16 years experience training and coaching HealthRHYTHMS facilitators, Christine has synthesized a curriculum that includes sales, marketing, facilitation, clinical applications, adaptations for different groups, working with themes, and corporate wellness programs. The 9 sessions meet by phone or computer on the ZOOM.US webinar platform, including live video, hand outs and power point slides and more. Building Your HealthRHYTHMS Facilitation Business - Coming Soon! Challenges & Opportunities in the Adolescent Protocol - Coming Soon!